Sciblogs | Is New Zealand prepared for a major oil spill? Is New Zealand prepared for a major oil spill? The ecological disaster unfolding in the Gulf of Mexico has reminded us of how fragile our natural environment is and the repercussions we face when our exploitation of natural resources goes wrong. According to Reuters, 210,000 gallons (795,000 liters) of oil a day is pouring into the Gulf from a ruptured oil well. President Obama has called the situation “a massive and potentially unprecedented environmental disaster”. The region’s fisheries from east of the Mississippi around to the Florida panhandle have been closed. The Louisiana coastal ecosystem contains many endangered species and is in the path of the oil slick as it comes ashore. British Petroleum, which was the main owner in the Horizon Deepwater drilling project has claimed full responsibility for the disaster. This will cost it billions. Tragically, 11 crew members of the drilling platform are unaccounted for – presumed dead. This is an environmental and economic disaster of epic proportions. It makes you breathe a sigh of relief that we don’t have extensive offshore drilling going on in New Zealand waters or that massive oil tankers aren’t crowding our major ports. But the fact is, companies do drill for oil in New Zealand waters and the Government is keen to increase oil exploration with a view to finding out how we can further exploit whatever oil may lie under the sea floor around New Zealand. We are dependent on foreign oil, so oil tankers do move about New Zealand waters, particularly too and from the Marsden Point oil refinery. Imagine an oil slick spreading along the coast of Northland, or down the west coast of the North Island from Taranaki or coming ashore at Gisborne or Kaikoura’s windswept beaches. It doesn’t bear thinking about. Such a disaster could make any ecological damage done from mining in the conservation estate seem minor in comparison. The 2004 risk assessment confirmed that broadly speaking, New Zealand’s current preparedness for the risks posed by a one-in-a-hundred year oil spill event arising from activities in the maritime sector is sufficient. The concentration of resources around the main regional ports is also supported. The report cites a trend towards larger and faster container ships, more frequent visits from cruise ships and increased activity at regional ports as factors that will influence future planning for oil spills. Also noted is “a potential upsurge in New Zealand offshore oil and gas exploration and production in coming years”. What is the risk of a spill? 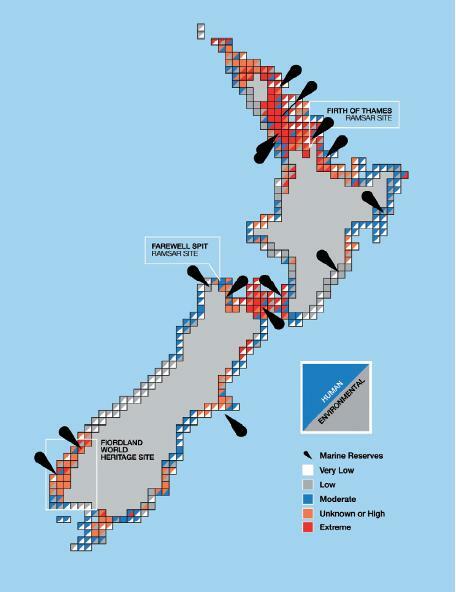 The graph below shows the New Zealand coast and the risk of various parts of the coast being affected by an oil spill. Marsden Point stands out like a beacon, so too does the region from Napier down to Wellington and on to Port Lyttleton which receives oil tankers on a regular basis. This second graphic shows the consequences of a spill on various parts of the coast. Each little square represents a 20km square section of coastline. Here is what Maritime New Zealand has to say about the sensitivity of New Zealand’s coast to oil spills. The areas that are of greatest environmental concern are those that have a high socio-economic value, have shoreline types that are very sensitive to oil spills (e.g. mangroves in the Auckland region) or those that contain important wildlife (e.g. birdlife on Farewell Spit). Ports are hot spots. The economic resources, human population and recreation areas located in and around Auckland’s ports contribute to that region showing as a hot spot. Also, the spill rate for ports is around 3 times higher than the spill rate for the combined coastal areas. The higher spill rate for ports reflects the greater risks associated with vessel movements in and out of harbours and the transfer of oil cargo and fuel. 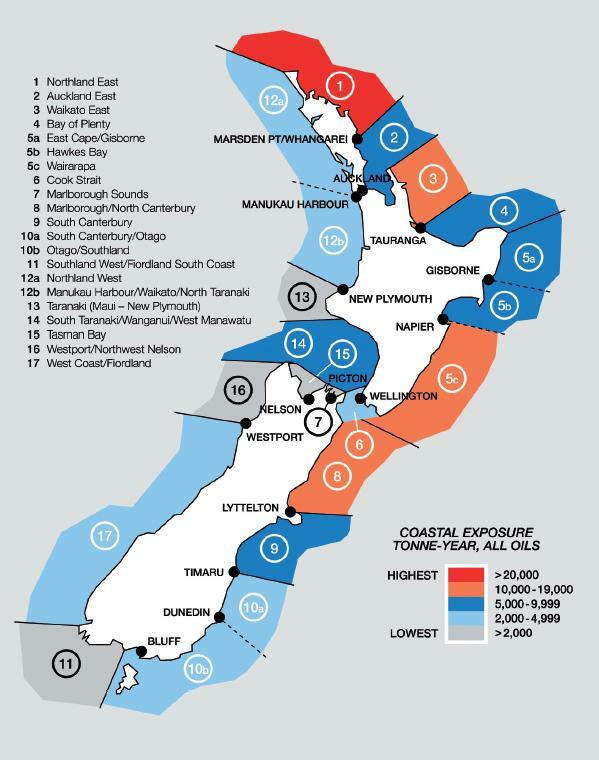 For NZ ports, Auckland has the highest spill rate, followed by Marsden Point, Lyttlelton and Wellington. The Auckland rate reflects the high level of activity and the large range of vessels using the port. The following list from Maritime New Zealand includes the more significant marine oil spills that occurred around New Zealand since 1990. An increase in oil exploration and drilling seems to be on the cards for New Zealand. If the disaster in the Gulf of Mexico gives us anything, it is a harsh warning that the benefits of offshore drilling can be completely undone in the form of an oil spill that damages sea and coastal ecosystems. As with mining the conservation estate, the pros and cons need to be weighed up very carefully.